The deserted Island of St. Nicholas is stretched over almost 2 kilometers and is the largest island in the area. The island is beautifully decorated with three sandy beaches, old buildings and dense Mediterranean vegetation. The beach water is clean and ideal to take a dip in. Most of the island area is prohibited due to snakes. There are cafes and restaurants on the island. Use a Taxi and then a Ferry or a boat to get to the island. How popular is Island Of St Nicholas? People normally club together Citadel and Budva City Walls while planning their visit to Island Of St Nicholas. Best experience in my whole life! This place is amazing . Much better then budva. Beautiful clean water . Great Island, little to much big Stones on Beach for my taste and all restaurants full on people so dont come hungry. 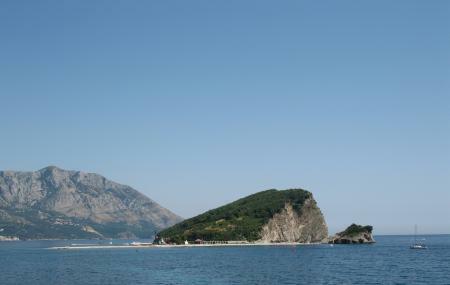 This place is a recommendation in every Montenegro guide and what can I say, it was a truly beautiful experience. But no place is perfect do let’s get to an honest review: every journey start with the first step and this would be to get there in the first place. Because of the current And the traffic so would not recommend to swim there. I did not find a Kajak rent place, do what is left: a watertaxi, easier said than to get online information about that, hence my photos with departing times. You can go by private taxi for 10 euros directly at the harbor or by group boat (3€) down a little bit along the harbor or even the Katamaran in front of the Jadran restaurant (3€). When you arrive at the island you will see a lot of places beside the deck chairs for rent to settle with your own stuff. It is a stone beach with most of the time round pebbles so prepare for that. There are toilets in this location but you have to pay. This is in my eyes, given the circumstances of isolation on an island, a no go, but ok... I never tried the snack bar, it seemed ok, no one complained. If you are caught in the rain you will hardly find some place to protect yourself from that because most of the roofs are leaking. You can lay in the sun the hole day there are no natural hindrances for that. A sunset can’t be observed. In my opinion you are missing out big time if you don’t snorkel. A lot of fishes, even „Nemo“ sometimes. Beautiful places are around the large rocks, it is simply amazing to experience those. Swim shoes are highly recommended. If you want to return to the mainland you can do that easy every 10-20 minutes. Have fun.